Leonardo DiCaprio: Girl Gone Wild. All I’m saying is: Leonardo DiCaprio should stop being prettier than his female co-stars. In ROMEO + JULIET, snub-nosed Claire Danes bravely steps up to out-femme Leo’s manly prettiness. And fails. 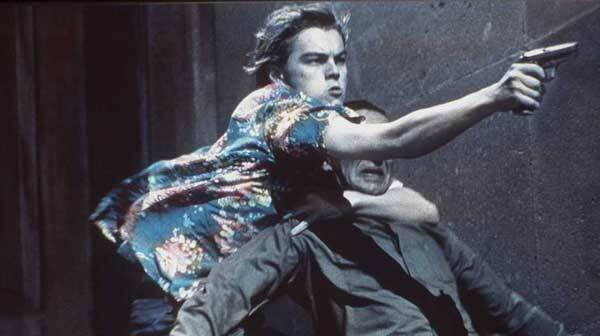 Leonardo is Romeo (kinda archly poetic, no?) and Claire is his Juliet. 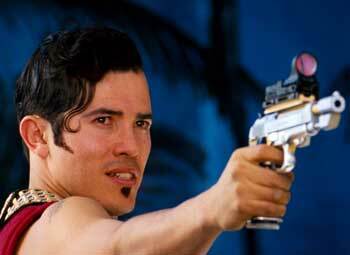 Shakespeare‘s retelling of Ovid’s Pyramus and Thisbe is retold with creative conceptualizing and high-voltage visuals by Australian thunderboy, director Baz Luhrmann, as an urban gang battle with a decidedly MTV-ian thrust. Alas, Luhrmann’s noble idealism in re-inventing the Bard’s most famous play for a generation weaned on music videos and boy bands unfortunately falls on ears deaf to irony, sarcasm, double entendre, punning, words larger than six letters and intelligence. Which pretty much rules out Shakespeare’s oeuvre. Throwing out major portions of text (“Text? What’s that?” mumbles Generation X), yet elocuting the remainder verbatim, performances are unevenly astounding, for when the actors can stop shouting at each other in the manner of Entertainment Tonight hosts declaring showbiz headlines, their occasional fluidity creates pockets of crystal clarity that move with the rhythms Shakespeare intended. Alas, it is unsustainable for most of them. Thrown into this mix of varying talents, Dash Mihok, Jamie Kennedy (it was all I could do to stop imagining them prefacing everything with “Yo yo yo…”) and DiCaprio stand out like ailing speechaphobics against the menacing fluidity of John Leguizamo, the simple sincerity of Claire Danes and the authoritative Shakespearean veteran, Pete Postlethwaite (still pushing 55, as he was 20 years ago). 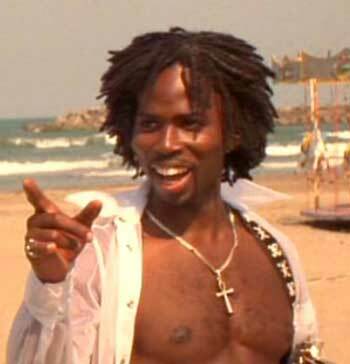 As Mercutio, cross-dressing Harold Perrineau steals the show in his mini-skirt, bra and command of Shakespearean rhythm. And look at those legs! The precursor to all Chick Flicks, you know the old story: boy meets girl, boy loses girl, girl drinks poison, boy kills himself, girl wakes up, girl kills herself. Ain’t love grand? aka: ROMEO + JULIET, ROMEO & JULIET. aka: WILLIAM SHAKESPEARE’S ROMEO AND JULIET. Writers: William Shakespeare, Craig Pearce, Baz Luhrmann. Starring: Leonardo DiCaprio, Claire Danes, John Leguizamo, Harold Perrineau, Pete Postlethwaite, Paul Sorvino, Brian Dennehy, Paul Rudd, Vondie Curtis-Hall, Miriam Margolyes, Jesse Bradford, M. Emmet Walsh, Jamie Kennedy, Dash Mihok.